The most well liked TV actress Sanam Saeed has got married last night with her childhood friend who is an established bank. Mr. Farhan has been friends with Sanam since they were young. 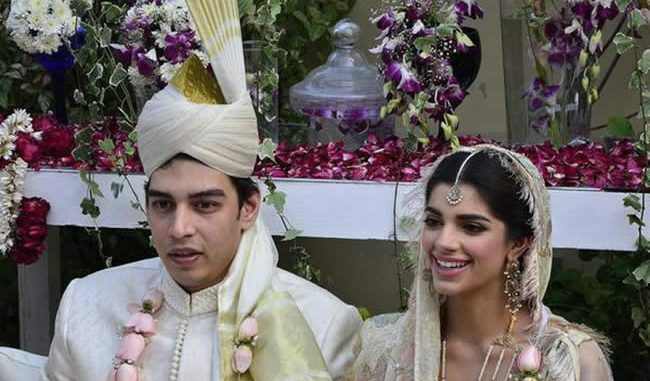 Zindagi Gulzar Hai leading lady Sanam Saeed husband turned out to be a Karachi based banker instead of Bangkok based businessman. So all the rumors about her husband was baseless. Sanam Saeed is one of the leading Pakistani actresses who has nailed it though her brilliant and applauding performance in block buster dramas like Mera Naseeb, Mata-e-Jaan Hai Tu, Zindagi Gulzar Hai, Kadurat and Firaaq. The gorgeous actress ventured into movies as well and will shortly be seen in Anjum Shehzad’s Mah-e-Meer with Fahad Mustafa and Iman Ali which will be releasing this year. Saeed was born in London ; she belongs to a Pakistani Family and moved to Karachi when she was six year old. She did her O-level from Bay View High School Karachi and A-level from L’ecole College. In the age of 16, Sanam starting appearing in TV commercials. When she was grown up little more she has started her career as a model, not only that she has won L’oreal Paris Award for Best Model. Sanam also remained a popular VJ Model. Sanam entered in to Television Drama industry in year 2010. Started acting as a supporting part in the 2010 ARY Digital serial, Daam as adaption of Umera Ahmad’s novel of the same name inverse Aamina Sheik and Sanam Baloch. Now as Sanam has entered into a new phase of her life. Fashion Central wishes this young and beautiful couple with lots of happiness and prosperity. Andy Cohen’s New Show “i Slept With A Celebrity” Is Bound To Be A Hit!